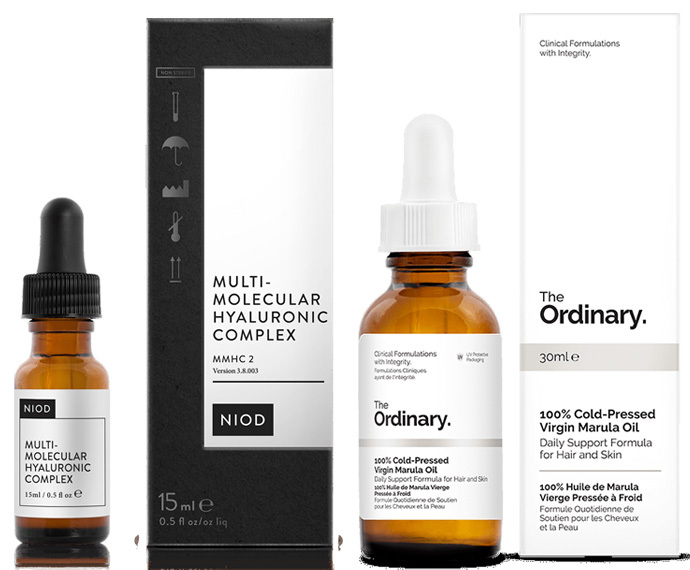 I thought you might like to know about my recent trial of some of The Abnormal Beauty Company’s products, in particular the Niod range, which is a bit more grown-up-woman that the more Millennial based stuff and The Ordinary, which we’ve mentioned briefly before. This brand is all about being transparent about the contents of the jar, it’s a product made of some naturals and soe some lab made chemicals and all listed clearly on the website. I quite like the science-style bottles, all glass droppers and amber glass, which haven’t had any money wasted on them in terms of fancy labels and open-the-box experiences. Now, fessing up, I am a bit of a natural-loving girl, in that I like my products to be organic if possible and extracted from plants rather than petrochemicals. 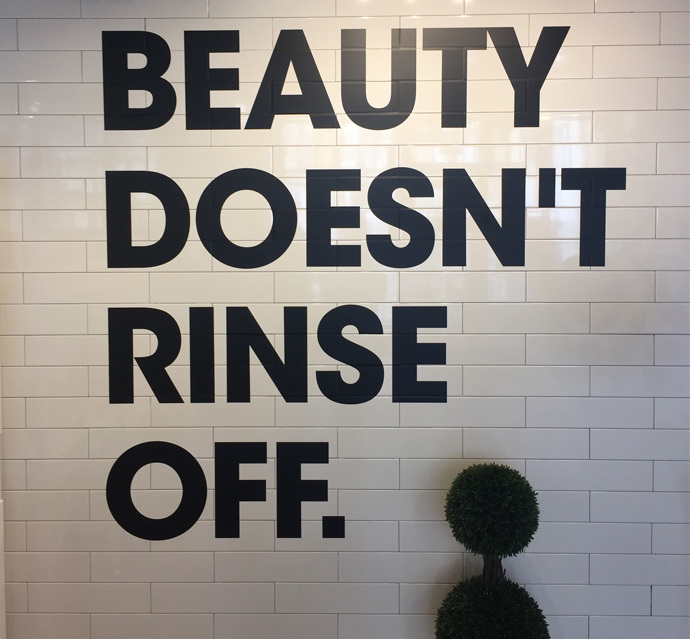 However, I recently did a big day-job where I needed to go into a Deciem store (which houses all the brands from the range) and thought while I was there, I’d try out the service and buy a product or two for research. I went to the Spitalfields store, where I was picked off swiftly by a smart assistant who impressed me with her in depth knowledge of the range. Yes, I KNOW this should be a base level expectation, but I’m a bit tired of going into stores and being talked to by a sweet but clueless 25 year old who can’t yet imagine what mature anything feels like. 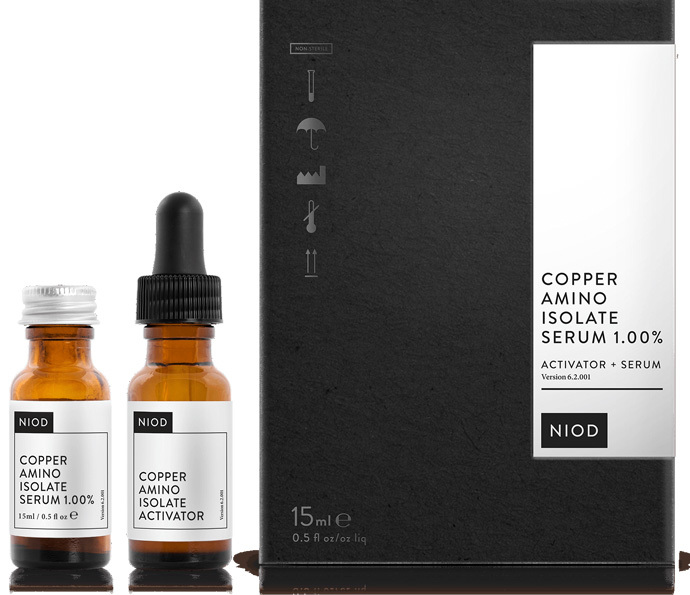 She looked at my skin and took me straight to the Niod range, where she recommended a weird blue liquid called Copper Amino Isolate Serum, at 1%. ‘You need help with the texture of your skin, you’re probably using great moisturisers that aren’t sinking in because they are struggling to be absorbed’ she said. ‘Yeah, yeah’ I thought, but went along with it. The active watery solution is used twice a day, just four drops, massaged in. 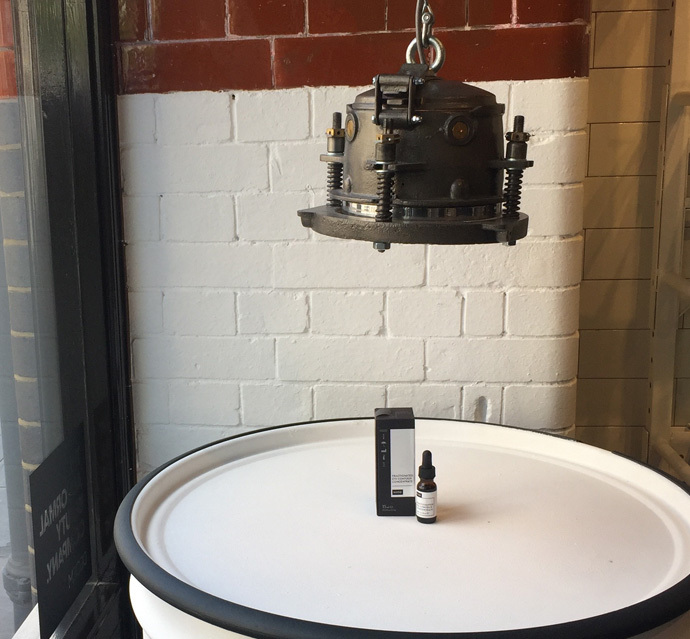 ‘Then I’d try the Multi Molecular Hyaluronic Complex (MMHC)’, she continued, which is pretty concentrated and what goes into most pro-age product in small quantities, but we sell it as a liquid you can use in drop form directly on the skin”. And if you take a look at the website, you can see what I mean about science-y, there’s a very lengthy explanation on the origins of Hyaluronic acid. It talks to you like you’re a grown up. Cutting to the chase. I’ve been using both products for about six weeks, and they are, speaking frankly, amazing. My skin -which was in pretty good condition already – is a softer and clearer. I have no line-count-audit to refer you to, but I’d say my wrinkles are smoothed out a bit and I don’t have that rough dryness I’d sometimes get on my forehead and cheeks. The MMHC instantly improves the touchy-feely plumpness of my skin, and I put The Ordinary’s Cold Pressed Marula Oil after this and my skin feels so good I often forget to put on a moisturiser, something I could never have imagined, I ALWAYS need a moisturiser. Although these products are not cheap (Marula oil £8.10, MMHC £25, Copper Serum £38) they are nowhere near as expensive as we are used to paying for this quality and the power of the ingredients. The brand is vertically integrated so it can control all aspects of its supply chain and product range. It’s a disruptor, so it aims to shake things up by cutting out the middle man to sell better value, quality product directly to the consumer, while having a transparent supply chain and full disclosure on product ingredient. This seems pretty appealing to me. I know we’ve been here before with cheap fashion (Primarni I’m looking at you) and there might be a catch somewhere along the line (Estee Lauder took a minority stake in the company recently) but at the moment I’m super impressed with what I’ve tried. Anyone else been using anything from the range? What do you think? Thanks……….It’s always interesting to hear about new products, particularly if the reviewer has tried them. I still think the best advice is to start taking care of your skin as early as possible and to be consistent with your skin care whatever products you use. When I was a teenegaer in the 1960s there weren’t loads of affordable products. My mum encouraged me not to use soap on my face and never to go to bed without taking off your makeup. I used coconut oil to remove eye makeup and Oil of Olay (as it used to be called) both as a cleanser and as a moisturiser. I’d be interested to know other readers memories of skin care. Yes, like you I lean towards the natural end of the skincare/cosmetic spectrum and particularly dislike putting anything with silicones in it on my skin. So I tend to mostly use REN, Pai and when I can afford it Odacite and MV Organics. 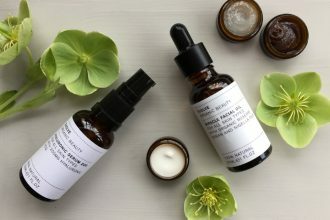 However I do supplement with stuff from the Ordinary (various vitamin c serums, the lactic acid 5%, and the hyaluronic serum and the rosehip which I love). I tried the blue copper one from NIOD and wasn’t impressed but I’m not sure what I was looking for! I hated voicemail masque but it is silicone heavy so that’s not surprising – the red clay mask by NIOD is good I find. I like the no nonsense approach but am wary about the involvement of Estee Lauder. However there is a “letter” out there from the founder and he sounds very passionate about keeping the various brands exactly as they are. 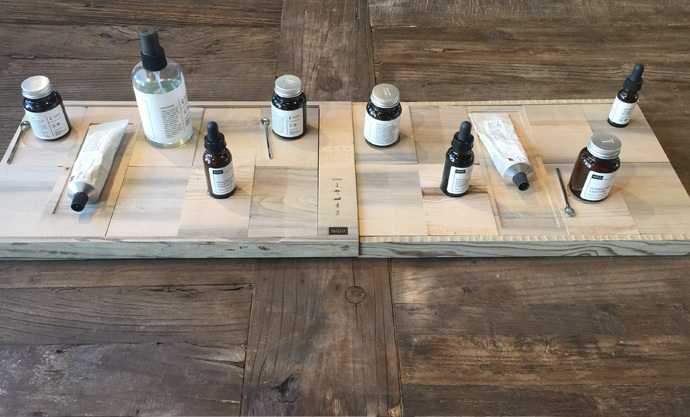 Have been using Niod CAIS and MMHC since Christmas and my skin is much less dry. I go through the CAIS (blue liquid mentioned) so quickly though – I find it impossible to use only 4 drops and cover my face/neck. I had the Vogue book too Amanda! In fact I think I probably still have it.